Pray for a Great Priest! The first biopsy of the mass in his lung was, unfortunately, inconclusive. He is undergoing another biopsy this morning. He is then scheduled to meet with Dr. Orringer, an internationally acclaimed thoracic surgeon, at U of M this Friday, Oct. 12th, at 8:00 a.m. (It is an appointment and not a surgery date.) Please continue to pray for wisdom for the doctors and for the Lord’s grace to surround Fr. Gerald in every way he needs it. Here is the message Fr. Gerald wrote for his parish. He is going in for a lot of tests and my cousin Ron Ray is taking him to the Solanis Casey Center in Detroit for prayer this week. Stay tuned! Fr. Gerald Gawrowski is a young, vivacious, orthodox priest in love with Jesus and His Church. 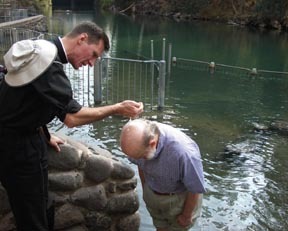 He has been the spiritual director for a number of our Holy Land pilgrimages. Everyone loved him. He was going to accompany our pilgrimage group to Rome October 10-19 but had to cancel. He would be aghast knowing I have put this on-line since he is very humble and non-assertive. He wants to help people not be the center of attention himself. I would only have done this since it was already made public through an e-mail announcement from a local parish. Click here for his parish website. But he needs our prayers at this point. Even though he is an avid runner and very careful with his diet, they have just diagnosed him with a large tumor or growth in his lung that has spread to his bones. He is very relaxed about it — he is right with God, but I would like to ask the faithful to pray for this good man that God's will would be done.